Meteorite that created giant hole entered state illegally, authorities believe. 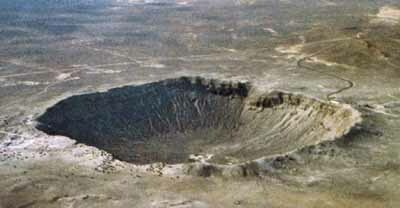 Acting on a tip received after passage of Arizona's tough new immigration law, police have arrested Meteor Crater. In a daring predawn raid, Sheriff Joe Arpaio and a team of officers swept into Northern Arizona and surrounded the landmark, which made no attempt to resist. According to scientists, Meteor Crater was formed when a massive nickel-iron asteroid immigrated to Arizona illegally from outer space. Critics of the crater said it was a drain on Arizona's economy and took jobs from American asteroids. Gov. Jan Brewer said the crater's arrest proves that "racial profiling won't be a factor" in enforcing the state's immigration policy.